Disclosure: This post is sponsored by Brazos Walking Sticks & we received a walking stick for the purposes of the review. All opinions and thoughts are my own. Do you have a goal for 2019 to get outdoors more with your family? One of the best ways to exercise as a family is to go on family hikes (or if you do not live near any hiking areas, make it a point to find new parks for family walks). One of our goals for this year as a family is to do at least 1 family hike every month. Not only is a hike together a great way for the whole family to exercise and a lot more fun for kids, but it is also an important way to spend time together screen-free and have more time to talk together, explore & learn about new areas around where you live. If you are new to hiking with your kids, I wanted to share some of our favorite items to bring with us on our hikes. Whether we are going for just a short, hour long hike nearby or a longer half day adventure, we always try to be prepared with the basics in our backpacks to be prepared for any emergency. The most important items to bring with you are the “10 Essentials” – this is the term used in the hiking world for the items you should bring with you on every single trip, regardless of whether it’s one mile or 10 miles, as you never know what you could encounter or what could happen on your hike. But I’ve also found that there are additional items that are helpful for those of you hiking with kids! I will always remember the story of the 140+ hikers in the Columbia Gorge area in Oregon who had hiked just under 2 miles in to Punchbowl Falls. Little did they know, the Eagle Creek Fire would start while they were at the falls & they would be forced to sleep overnight in the forest and make a 14 mile trek to get around the fire & back to safety. Most of them did not have basic supplies as they expected it to be just a little under 4 miles round-trip for the hike. Definitely a lesson in always being prepared even for the smallest of hikes! Shelter – You never think you will need this, but always important to have just in case. We keep small emergency space blankets in our backpack, but if going on a longer hike, you could bring a tent, tarp, etc. Look for ones that are lightweight & compact. Sun Protection – always bring a hat, sunscreen & sunglasses to protect your skin & your eyes, no matter what the weather is like. You’ll need sunglasses for the snow especially, but even in cloudy weather, still need to watch for sun exposure with sunscreen and/or hat. Insulation – Always be prepared with warmer clothes in case you have to stay overnight, as well as rain gear. You want to consider the most extreme weather you could encounter & pack for that. Avoid cotton, but try to use wool or poly blends to help wick moisture away. Fire – Fire is important not only for staying warm, but also as an emergency signal. You can also cook with it, boil water for drinking, etc. Consider matches in a waterproof container, fire starters and/or lighter. Tools & Repair Kit– Always make sure to have a knife or multi-tool with you for so many uses (cutting wood or rope, using as a screwdriver, can opener, etc) . The National Park service also recommends duct tape & scissors as well for any repairs needed. One thing we have found to be important on our hiking trips is for each of us to have a small backpack (with one bigger backpack for the whole family that dad or mom will carry). We started our girls with backpacks even as preschoolers (tiny little backpacks) as we felt it was important to establish good hiking skills early on & that means always being prepared with your own backpack. Typically, they always carry their water source (whether it’s a hydration pack – we like the backpacks with hydration packs) or a water bottle, so they can access their water any time they need. (We keep the larger water bottles to refill in the main backpack). It is so important to always stay hydrated on a hike and with a hydration pack, our girls have always found it is more fun to drink from the straw, so that tends to get them drinking more, too. We also like to carry our own snacks in our pack, so they can access on their own when we have snack breaks (depending on the age of your child – you won’t want to do this, if they will eat their snacks in the first 15 minutes of the hike – ha!). If they have a kid-friendly camera, they can bring that in the pack to take pictures when they want. Or if we are hiking in a National Park, they can do the Junior Ranger badge & keep this & a pencil in their pack to fill out as they go. We also will keep warmer clothes in our pack like a light jacket or a pair of gloves. Even in the fall or spring in the Northwest, it can get chilly in the early morning or later afternoon if you’re in the shade. Depending on where you live, this may be something you never leave home without – or if you are in certain areas of the Northwest, you may think you don’t need it as we don’t have a huge problem with mosquitos out here. However, even out here in the NW, we have had numerous times when we forgot bug spray & were quite miserable without it. If you are hiking anywhere near water (rivers, lakes, etc), those bugs will be out in force, even if it’s not an area you would expect. Kids will be miserable without bug spray, so definitely not one to forget if you think there’s any chance you will encounter bugs. There are a number of environmentally safe bug sprays you can use in the outdoors, too. This is such an important item to always carry with you & we like our kids to carry their own bottle as well. My girls love the cute little hand sanitizer bottle holders you can buy in the stores so they can keep it as a keychain. They like it for looks – I like them for the ease of use as they are always readily available with their backpacks on. I can’t tell you how many trailheads we go to where there may be bathrooms & sometimes water to wash hands or sometimes now, but rarely soap it seems. So, always keep the hand sanitizer with you where ever you go for your kids to use frequently. Even if you have brought warmer clothes or gloves/hats, kids definitely expend a lot of energy on hikes. They are often full of energy at the beginning, wanting to run ahead, explore every big rock or tree, and hop between logs. However, by the second half of the trail or nearing the end of the trail, they may have burned off all that energy & need encouragement to keep on going. I’ve also found that this is when their body is cooling off faster & therefore, they may get cold easily. Even if it’s a warmer day, with so many hikes in the woods, it can be cooler, so we’ve found it helpful to keep a small supply of hand or toe warmers in our backpack. Just having that extra bit of warmth to keep in their coat pocket or inside their boots can help with keeping spirits up so you can finish your hike strong! 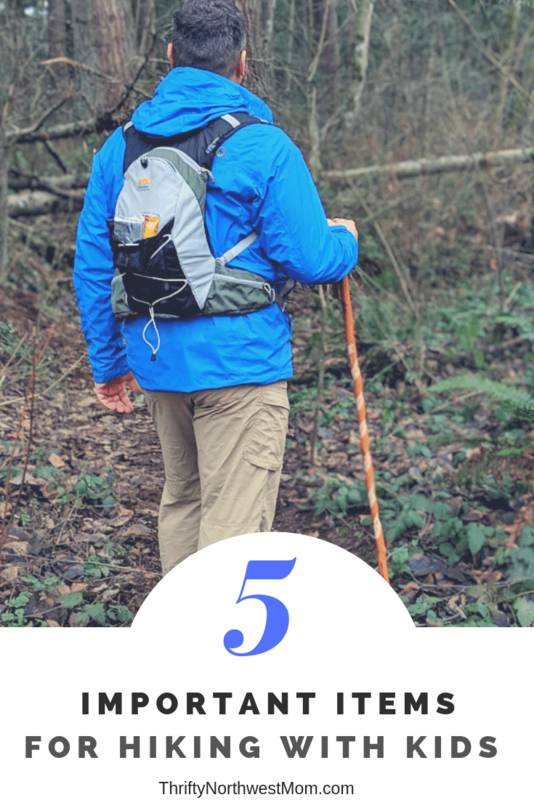 It wasn’t until I started regularly hiking in the Northwest with my kids that I realized the value of using a walking stick or hiking poles while hiking. This is not always a typical item that many would think of to bring on their hikes, but if you look at experienced hikers, most do bring walking sticks or poles with them for several key reasons. No matter where you are, hiking will be occurring on uneven ground, whether it’s gravel & pot holes or roots & rocks you will be climbing up & over. By having a walking stick or hiking poles, you will increase your mobility by providing a stable source that you can lean on whenever you hit those patches that you are unprepared for. It will enable you to go places that you may question without any support or you’ll be regretting later if you tried it without a stable source to hold onto. Here in the Northwest, trails are often wet & slippery, especially during the off-season even if it hasn’t rained that day, the thick trees can retain that moisture on the trail for longer, so one of the most important reasons to bring a walking stick or poles is to increase your stability on the trails, no matter what the weather is like or the trail conditions. With the frequent rain, trails can be muddy which creates instability and more chances of getting hurt by slipping. I’ve also found many trails to be full of roots from all the trees, especially on the western side of the Cascades in the northwest. Between all the roots & rocks that can be found on trails, there is a much greater chance of twisting an ankle or a knee as you head up or down a trail. Having a walking stick to lean on and provide that support in those slippery areas can save you from an injury on your hike. Having an injury on a longer hike could quickly turn into an emergency if you are not able to get back to your vehicle or to get help easily, even more difficult when you are with your kids, as you have to worry about keeping them safe as well & you don’t want to delay getting off the hiking trail & back to safety. The other important reason for using a walking stick or hiking poles is that they provide support for your knees heading downhill on a trail. I have struggled with knee issues on almost every downhill for hikes. I have no issues at all any other time with my knees – walking, jogging or hiking uphill. But boy, I get pain & swelling heading downhill, especially if there are a lot of roots & rocks to step down from or stairs. I am in several NW hiking groups on Facebook and this is the number one suggestion from the members when asked about knee problems on hikes – to use a walking stick or hiking poles on your hike to give you that support as you make your way down the trail so it doesn’t put as much pressure on your knees. The most experienced hikers always carry a walking stick or poles on their hikes for knee support, but also for the stability on trails as I mentioned earlier. I’ve heard many stories about how their walking stick or poles saved them from injuries & falls on everything from steep climbs to muddy trail conditions on flat hikes. So, this is an absolute necessity for us now. If you are hiking with young children (babies or toddlers) that you may be carrying in a pack, it may seem like a pain to have to carry something else. However, carrying a walking stick or hiking poles on your hike can give you more security & stability while you’re carrying your little one. Your balance will be a bit more off when you carry a child in a front or back pack, so that extra stability & support will give you more confidence to get out there & hike with your kids. Even if you are holding a child’s hand, your other hand could be on the walking stick to provide you both more support on those muddy or rocky/root-filled trails. For older kids, find them a walking stick to use on their own so they can feel more confident tackling new trails to hike as a family. We had the opportunity to try out a walking stick for hiking by the Brazos company. Brazos has been making high quality, hand-crafted wooden walking sticks, hiking sticks & walking canes for almost 20 years. They are located in the Brazos River Valley area in central Texas & most of their products are made in smaller workshops by local craftsmen, so you know you are getting a high-quality product. The wooden walking sticks are made from the highest quality native & exotic trees, so they are made to last many years. Brazos has many varieties of wood that you can choose from when picking out a walking stick. Their walking/hiking sticks are made from trees including sassafras, hickory, sweet gum, iron bamboo & more. Most of the wood is naturally harvested from places like Arkansas, eastern Texas, western Louisiana, & the high mountain deserts of New Mexico. So, you can choose the look that you like the best as well as the type of wood that you are most interested in. There are many unique designs with the wood, too. There are different sizes you can choose from as well, so that you find the stick that will fit your body the best to make it the most comfortable for hikes (sizes range from 41″ – 58″). If you are interested, your Brazos walking stick can be customized as well with laser engraving or adding customizations such as spikes for the bottom (instead of the rubber grip), compass, thermometer, or whistle embedded into the top of the walking stick, a case/cover & more. 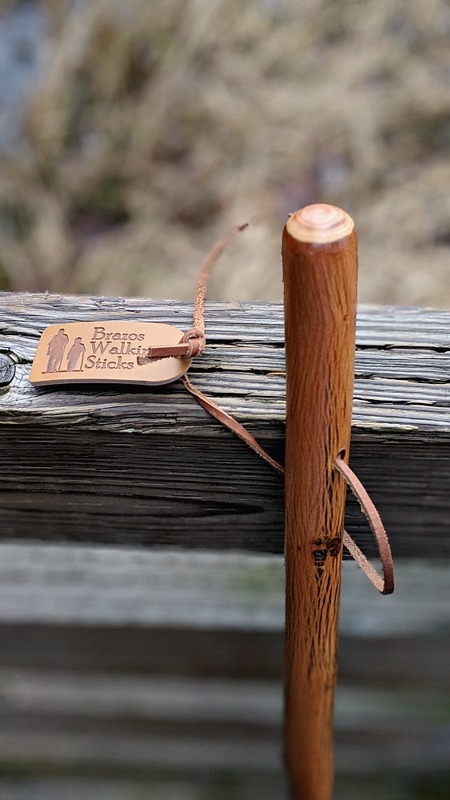 If you want a more compact stick for traveling, check out the Traveler’s Walking Stick. 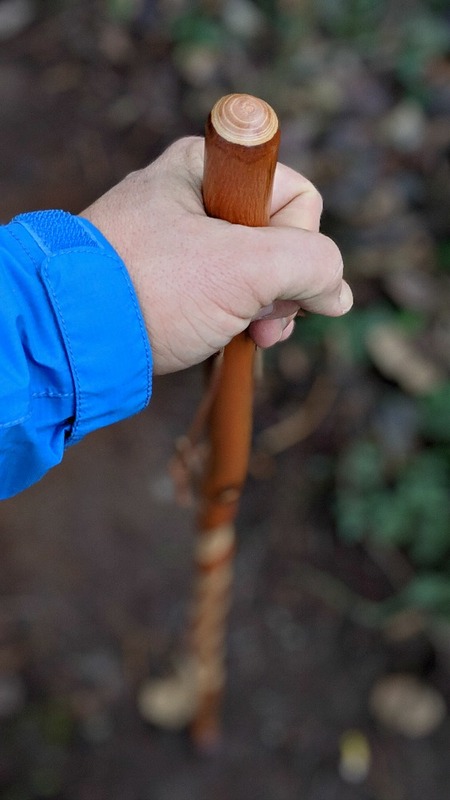 We tried out the Texas Traveler Hiking Stick, which is affordably priced at just $44.99. 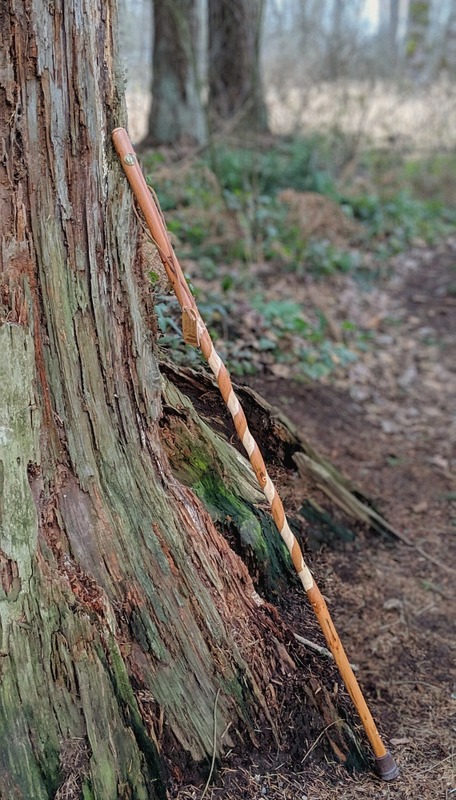 This is one of their best-selling walking sticks and we love that it’s unique looking with the twisted, wood pattern going down the stick. They do have several different color stains you can choose as well. This hiking stick could be used anywhere from urban neighborhoods to serious hiking trails in the mountains. It is a very sturdy stick and when you grip it at the top, your hand doesn’t slip, but holds on well. It also has a leather strap to place around your arm just to keep track of it better in case of muddy or slippery areas. The bottom has a rubber gripping to keep you feeling secure & stable in any condition. 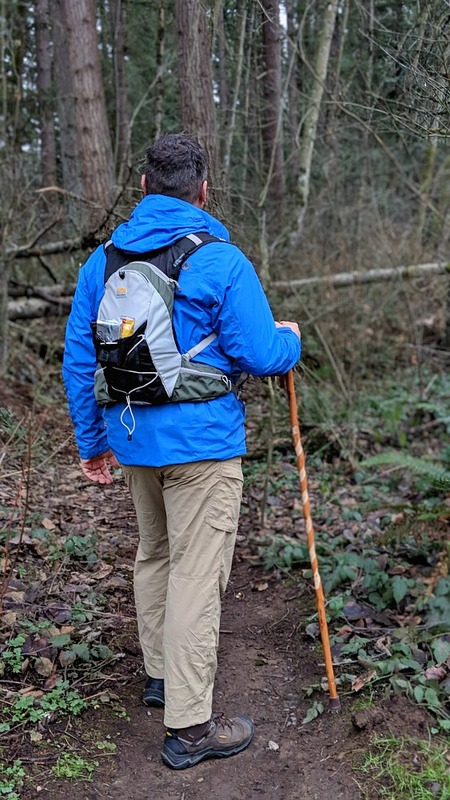 We have had so much rain here in the PNW for many weeks over Christmas time that we definitely got to test it out on the muddy trails and it was so nice to have a solid stick to rely on & lean on while navigating the wet areas. It also fit easily into our car, we just laid it behind our backseats, from side to side & it was a great fit, without taking up much space. Mainly my husband and I used the Brazos walking stick as it is sized for us, but our girls took turns using it as well for stability as needed on our hike. But it definitely helped me to feel more secure & stable with my balance by using a walking stick, so that I could feel more confident helping my girls as we navigated areas that were wet & could have resulted in falls. We can tell it’s definitely a well-made stick that will last us for years on many hiking trips! What are your favorite hiking essentials when you go hiking with your kids? Customized walking stick?? So cool!! Lots of treats is my addition!